Welcome! 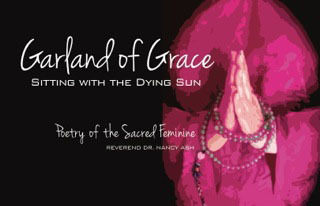 Enjoy a few sacred, awesome poems from my latest book, Garland of Grace: Sitting with the Dying Sun (published 2014). Garland of Grace is a collection of inspiring poetry to feed your Soul. Mindfully arranged as a spiritual journey for women and men, this unique book celebrates re-emerging power of the Sacred Feminine rising in evolutionary spirit. Here is rich sacred poetry and a glossary, lovingly crafted by veteran spiritual teacher and mystic, Rev. Dr. Nancy Ash. 52 heroic poems will nurture consciousness of a genuine balance between the Divine Feminine & Divine Masculine. If you have a woman or man in your life - a mother, father, daughter, son, sister, brother, lover or friend - this book is for you. "...Garland of Grace: Sitting with the Dying Sun is a masterpiece of realized spirituality, perhaps even closing in on the precincts of Sacred Literature." "Nancy Ash's poetry is gorgeous and such a delight to read... Her latest poems, Garland of Grace, are like direct sips of divine nectar from the Goddess…"
Awaken the Power of Your Feminine Soul"
... Ah! Garland of Grace is a real and beautiful treasure… "
It's my absolute joy to share a few of these interspiritual, inspirational poems from my latest book, Garland of Grace: Sitting with the Dying Sun. Please visit to read more (free "look-inside feature") @ Amazon.com where this collection is available for purchase. Thank you kindly for supporting my ministry - it means so much. Every purchase helps to keep the creative work thriving here at this Doing a 360 website. Thank you for visiting this page today. I trust you were inspired with a few words gathered here in some of these awesome poems - a sacred 360 collection of musings from my heart-of-hearts, Soul poems to provide comfort and peace during these most challenging time of awakening.